Pie Crust too scary? Try these Homemade Cherry Pie Bars with a Cream Cheese Glaze; all the great same flavor but no rolling! My Grandma Bathe was the ‘pie’ Grandma. That was her forte and one of the many reasons I loved going to her house for holiday get togethers; she always had a wealth of pies making the sideboard in her dining room groan; made us kids groan too! 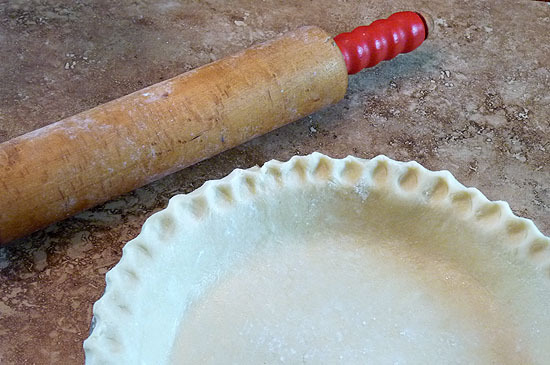 I’ve inherited her rolling pin which I know must be over 75 years old and while it brings her into the kitchen with me it was only recently that I discovered her magic with pies when I discovered the ‘secret’ to great pie crusts. I’m betting the farm that my Grandma had to have used lard in her pie making too; maybe even the heavenly leaf lard that I’ve just discovered. Who knew? Certainly not me. Still that pie experience at Grandma’s did not follow us home. While I remember pumpkin pies at Thanksgiving I don’t recall a lot of pie baking as I was growing up. 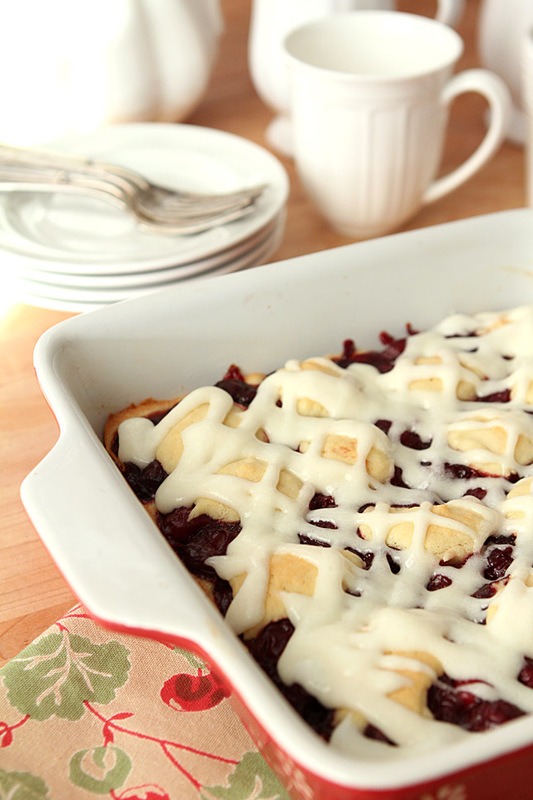 My mother would more than likely make something closer to these Cherry Pie Bars using a can of cherry pie filling. Not that I blame her. Six kids? Oh my. I’ve been using this recipe for more years than I can remember; while I might have tried my hand at making pies more often than my mom, I brought the single mom card to the table and that seldom left enough time for homemade pies for anything other than Thanksgiving. Enter these pie bars that I could do more easily and quickly. A cakey/shortbread type batter is covered with cherry pie filling (check out my homemade version pictured above), dotted with a bit more batter and then finished after cooling with my updated drizzle which includes some cream cheese and butter. I’ve always thought they were a nice little treat but my friends who were here with me yesterday raved about them and you know what; they’re right. ESPECIALLY if you use fresh fruit. 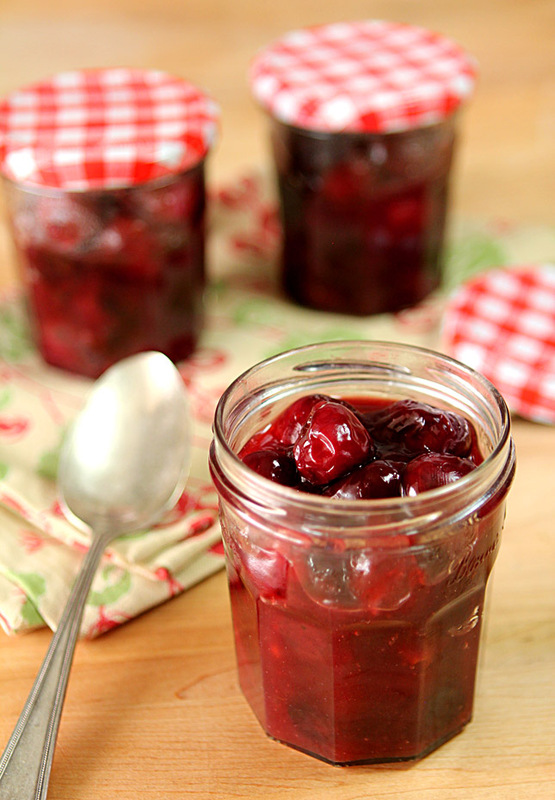 If you can’t find any fresh cherries, go ahead and substitute the filling with some good canned product; they are still wonderful! My friends Sandy and Ansh spent the day with me making this fresh peach pie but snacking on cherry pie bars. Well we ate a lot of stuff but these were definitely a hit! I used cherries to make cherry pie bars but would easily substitute blueberries or peaches in the recipe using prepared pie filling. As a matter of fact it would be fabulous with almost any summer fruit; make one before summer is gone…hurry! Arrange a rack in the middle of the oven and heat to 350°F. Coat a 9x13-inch baking dish with butter and set aside. Place the cherries, sugar, lemon juice, and cornstarch in a large bowl and stir to combine; set aside. Place the flour, sugar, baking powder, and salt in a food processor fitted with the blade attachment and pulse to combine. Add the egg yolks, almond extract, and butter. Pulse in 5-second intervals just until the dough comes together, about 1 minute total. The dough will be soft and slightly crumbly. Transfer 2/3 of the dough to the pan; use a fork or your fingers to press the dough into the bottom of the prepared pan. Add the cherry mixture to the pan on top of the dough and spread into an even layer. Crumble the remaining dough on top of the cherries; evenly spacing it over the top of the fruit. (The cherries will not be completely covered.) Drizzle the dough with the melted butter and bake until the top is golden and the cherries are bubbling, 35 to 40 minutes. Put all of the ingredients into a mixer fitted with the paddle attachment. Mix until smooth. Drizzle over the top of the bars and allow to cool completely before cutting into bars to serve. When cherries are available fresh they are the best in this dessert but don't let seasonal changes keep you from preparing these bars with canned cherries; they're still fantastic! Mmmm, cherries. Glad to see this resurface! Bars, pies — it’s all good. Thanks! 8″ x 8″ pan would provide. Sounds like a really great treat! I see no reason why not Beverley; just pay attention to cooking time and when the dough starts to brown. Might be more than in recipe but not much. Ron’s favourite pie is cherry while one of mine is blueberry. Love this recipe and can see a dish of each of our favs in the future. I never thought to take my mother’s rolling pin when she passed away. After reading this post about your grandmother’s I’m really wishing that I had. The longer she is gone Paula the more special it becomes; I wish you had your grandmother’s too but clearly she has passed something special down to you in your love of cookies! I love that you have your grandmother’s rolling pin. It really is like she is with you each time you roll with it. These bars look amazing. 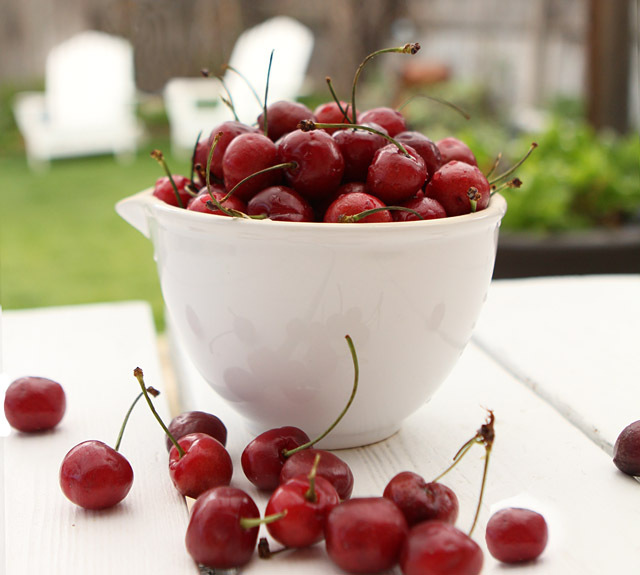 Thank you for including ideas of other fruits to use since cherry season is too short! Exactly how I feel Betsy; makes the effort that much more special. Barbara, what a beautiful collection of treasured pieces you have… and this recipe, well, cherry anything is good as far as I am concerned. Next time I have cherries I am so making this! I love cherry desserts! Thanks for this recipe! 4 cups cherry pie filling for an 8 x 8 pan? Wow! That’s cherry love (which I do)!! This is gorgeous and the kind of snack (as a cherry lover) I’d go nuts for! Perfect dessert, snack or breakfast. And change for another fruit? Not while cherry filling is around! I think the original recipe was for a 16 oz can of cherry pie filling. So I tried 2 cups. Um, no that will not do. I wanted every bit (and bite) of that surface to be covered in cherries! 4 cups did just that! Oh these were SERIOUSLY GOOD. And I also got to roll roll roll with Grandma’s rolling pin! So fun! Yes you do…reserved for only the very few. Considering how few family heirlooms I have; that rolling pin is so special; you know my Grandma was there helping you right? Lucky you! Why yes I am chuckling…OH NO!! But made me think I need to make a quiche with this super special dough; thanks for that! I’m thinking of all kinds of fruit variations for this wonderful recipe. 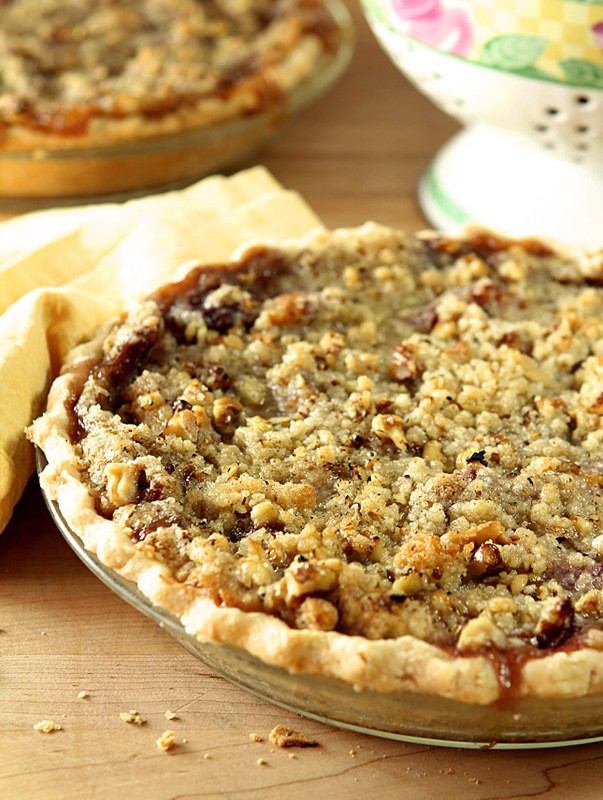 Since I’m cursed when it comes to making pie crust, I look for other pie-like desserts to enjoy – like this one! – which will be coming soon to my kitchen, I can promise you. I wish you had been here yesterday at my own ‘pie camp.’ Talked my friend Ansh through her first pie crust ever; even lattice work and it was a beautiful thing. You should try the recipe I’ve shared lately…half butter and half lard and all good! These sound wonderful. I am lucky enough to have some sour cherry jam that I need to use up and this is the answer. Love cherry anything, but especially pie. That would be perfect…I know you must have a cache of sour cherry something! I love this rolling pin John and see it everyday and use it regularly. I also have a platter and gravy boat that I keep secured from all use for fear it will break and I’ve used her china hutch and table for years as my own. When my daughter moved to NC I gave her the hutch and am saving the table for my other daughter (both small scale but a beautiful cherry wood). I was very lucky she chose to give things to me; when the vultures descended after her death grandkids were not allowed to have anything so I’ve always loved that what I do have was given to me!